As a professional dance instructor for more than ten years, Gio has an in-depth understanding of how the body moves – from alignment, to balance, to flexibility. This knowledge proves invaluable in his approach, as Gio focuses on how strength and fitness training creates a conscious awareness of body control – a critical component in helping one reach their fitness goals. 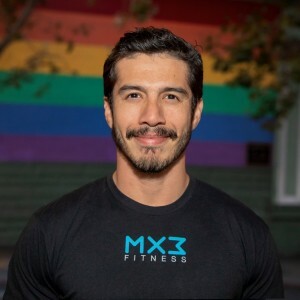 Using an integrated variety of techniques, including weight training, Pilates, and calisthenics, Gio knows how to tap into a client’s maximum potential, whether you are just starting out or have been training for years. One-on-one personal training sessions with Gio. Gio trains out of our Castro location.